The PTS Janam XG100 Windows Mobile Barcode Kit offers an an unmatched combination of a highly functional design with an optimized human interface for your mobile workers. With Microsoft's Windows Mobile 6.1 operating system, the XG100 is a powerful workhorse that delivers state-of-the-art computing performance in an exceptionally rugged package. 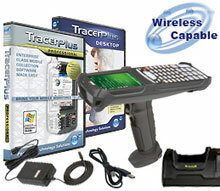 Featuring TracerPlus Professional data collection software in combination with the industrial-grade XG100, this kit is the right fit for countless mobile tasks ranging from warehouse management to field service.